On Saturday afternoons my dad and I would take drives through the country in one of the antique cars he restored with my grandfather. There was no radio. No electronic entertainment. We found stories in the landscape, the clouds, and the abandoned buildings that peppered the back roads of South Alabama. 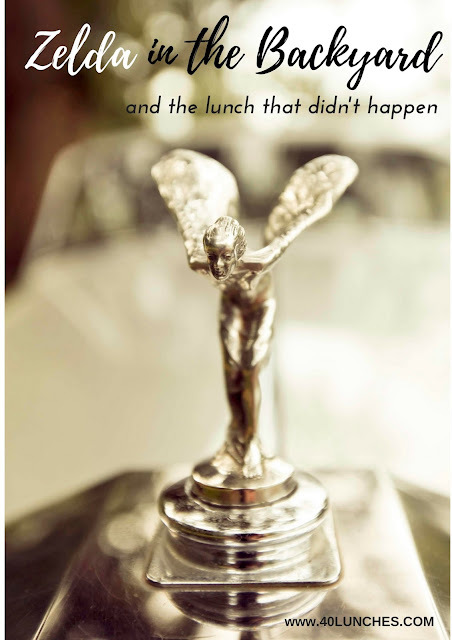 My grandfather loved Fords, and in his collection was a Model T, a Model A, and a Model S. But my father was an Anglophile who parked his 1961 Rolls Royce Silver Cloud among my grandfather’s collection of American made cars. It had white leather seats and little picnic trays in the back that folded down. The smell, a combination of wood, leather, and oil, is still ingrained in my memory. The car was majestic, with the Flying Lady adorning the hood. You might assume my father had money, but he didn’t. He usually drove a 1973 Pinto hatchback and was known to take clothes from the lost and found at the YMCA. When we went to Godfather’s for pizza on Friday nights he would send me around to the empty tables to grab the leftover pitchers of beer. Frugal would be a generous description. But in the Rolls Royce, dad was transformed into someone else; someone who was ostentatious, gregarious, important. When my grandfather died suddenly the car barn, which housed their prized possessions, was locked and our Saturday afternoon drives came to an end. My dad was heartbroken; the connection that he had to his otherwise distant father had been severed. My father died just ten week later, and the Rolls Royce remained locked in the barn. For reasons I never completely understood, the car had been signed over to my aunt; although, I suspect a bankruptcy my father filed for years earlier was the culprit. With my father and grandfather gone my mother made a valiant effort to keep me connected to my grandmother. But the visits were difficult and awkward. We had little to talk about. After one particularly unfortunately encounter involving what was left of my father’s belongings, my mother and I drove away. I assumed I would never see the car again. But then just as I was returning home for Christmas my senior year of college, my mother called to tell me that my grandmother had passed away. It had been more ten years since my father died and almost that long since I had seen her. My grandmother and I had always had a difficult relationship. She had grown up in a house with no running water or indoor plumbing. A product of the depression, she hoarded food and fabric. But she was also a skilled seamstress and a master gardener. Through sewing we found our common ground. I spent hours cutting out squares for what would become my first quilt, then stitched them together on her sewing maching with her guidance. When I arrived home I went to pay my respects. My aunt was now living in the house that I had grown up in, a smaller house on a large piece of property where my grandparents also had a home. It was strange sitting in the living room that once held my father’s things. It was there that my aunt told me that she was returning my father’s Rolls Royce along with what remained of his possessions. The car was removed from the barn and hoisted on a flat bed. The Rolls had been wrecked years prior; the front bumper was dented and the grill bent. My heart broke when I stepped into the car barn and saw so many of their beloved cars deteriorating. A friend’s father generously housed the car in his garage and was able to rebuild the brakes so that I could drive it once again. When it was in working order my mother and I had a picnic in the backseat. It was there that I rechristened her Zelda, in homage to Zelda Fitzgerald and the insanity in which the car came back into my life. The first time I took Zelda out for a drive on my own I followed the same route my dad and I took all those years ago. With the windows rolled down, I was bathed in the warm summer air. For a while the car was stored in a barn behind the Creek Indian Bingo Palace, but after it was damaged during a hurricane, I sent it off to a restoration shop run by a Brit in South Carolina. Money would go out. Reports would come back in periodically. After awhile, I heard nothing. When I got engaged I knew that I wanted Zelda there. If my dad couldn’t walk me down the aisle, then Zelda would take his place. When I inquired about the car, I got no response. The car was eventually located in a shed in Liberty, South Carolina, where she sat disassembled in hundreds of pieces. Reassembled, Zelda was there to stand in for my father. But Zelda wasn’t the only car in my life at that time. Perhaps if she was the story would have had a different outcome. The details of our estrangement are long and complicated, but like everything else in the family, it centered around a car; this time a 1908 Model S Ford. When my grandmother died I fought for the most rare and cherished of my grandfather’s cars. It was a fight that drove the division between me and my dad’s family even deeper. I’m sure they have their own version of what happened. After all I hadn’t been an active participant in their lives for many years. But my fight for the car wasn’t selfish or greedy, but rather rooted in my desire to salvage the work of my father and grandfather. Rather than leaving it to deteriorate, I wanted the car to be enjoyed. After a legal fight, the car was mine. With the Model S in my possession, my mom and I fulfilled my dad’s dream of taking it to the national car show. I was not prepared to care for the Model S, so when a collector offered to buy it, I accepted his offer. The car now sits in the private museum where a full time staff is able to care for it. Zelda stayed in my life for ten more years, but eventually I had to accept that I didn’t have the resources to maintain the upkeep. With the sale of each car I paid off my student loans; the Model S paid off my balance for undergrad, while Zelda paid for graduate school. My mother would have been happy knowing that in some roundabout way my father paid for college after all. When you lose a parent as a child, you lose the opportunity to get to know them as a person. The people who knew my father are quickly disappearing, taking with them the stories and memories that I crave. I reached out to my aunt – my father’s sister – in hopes that she would have lunch with me. I was hoping to piece together a few stories from his childhood. Unfortunately, she declined. I’m not surprised, but I am disappointed. I feel like those stories are slipping further and further away. I know she has her reasons for saying no, just like I had my reasons for walking away all those years ago. I don’t regret that decision; it was an act of self-preservation. There are stories from his life, from the years before I was born, that only she can tell. Those stories are now lost to me. When my grandmother died I wasn’t sure how to grieve the loss. What I discovered is that I was left to grieve the possibilities, the loss of the chance to get it right. I’ve also learned that we re-grieve the deaths of those we love at different stages in our lives. Now I grieve for my daughter’s loss, the loss of an opportunity to have her grandparents here to teach her, to tell her stories, to build their own memories together. Many of my memories are rooted in conflict, but there are so many others. I’ll always have the memories of our drives in the country, of ice cream sandwiches and Cokes in a bottle. There are the forts I built with my cousins, the hot summer days running around shirtless, eating watermelon and fresh blackberry cobbler. There is the quilt I made with my grandmother and the memories of making biscuits with her on Saturday mornings. There is knowing that while all of them were incredibly flawed people, they possessed an impeccable work ethic. For now, those are the stories I’ll share with my daughter. The others will come later.